Ever since the draft, when the Eagles seemingly abandoned the right cornerback position, I’ve been mulling over a theory. It may not be fully baked or in any way ironclad, but hey, this is just a blog. If random theories from people thinking way too hard about the Eagles can’t go here, where can they go? Besides, maybe y’all can help me make sense of this trend. I call it the DIN Theory, as in Drafting for Immediate Need, and hopefully it will help explain why the Eagles never seem to do what you expect in the first round of the draft. Basically the theory goes like this: if you can identify the one most important area, the one most obvious position in which the Eagles are deficient for the coming season, that is the spot the team will NOT target early on draft day. Let’s start back in 2007. What were the biggest holes after a 10-6 2006 campaign? McNabb had gotten hurt, but he was expected back at full strength. The O-line was rock solid. If anything was going to get the Eagles to the top, a #1 wide receiver might have done the trick. However, the Eagles brought in Kevin Curtis to replace Donte Stallworth and drafted Kevin Kolb — the long-term Donovan McNabb replacement — instead of someone who could help right away. After the 2007 season the wide receivers with Curtis had looked pretty good, if not spectacular. Could still use a #1 wideout, but a pass rushing defensive end opposite Trent Cole or a linebacker would also have been an immediate impact pick. But who did the Eagles go with? Trevor Laws, a defensive tackle on a team that already had two starters, and DeSean Jackson, a guy who wasn’t expected (at the time) to compete for minutes right away. Following the 2008 9-6-1 year, it seemed we’d found our number one wide receiver, but the team needed major help replacing their two departed offensive tackles and the incomparable Brian Dawkins. But who did the Eagles draft? A luxury offensive pick in Jeremy Maclin and long term RB prospect (no one expected he would be the starter so fast) LeSean McCoy. The immediate offensive line needs were filled in free agency/trades and FS was handed over to unproven Quintin Demps, middling veteran pick-up Sean Jones, and then eventually late-round pick Macho Harris. This offseason, the biggest hole was clearly at right cornerback. But the Eagles trust a hodgepodge of nickel backs (Hanson), injured former starters (Hobbs), former safeties (Harris), and another late round pick (Lindley). In the draft they went after a long-term rebuilding project for pass rushing which, on the whole, didn’t seem so bad in 2009. One could argue that Nate Allen was targeted in the draft to fix an immediate hole at safety, but he was still only a second round pick and was placed into competition behind Marlin Jackson and Demps. There are a lot of different ways to look at this, especially in hindsight, but I see a general trend here. The Eagles don’t use early picks on players they need to start right away, simply to fix immediate needs. The team would rather pick a long term starter or build depth than grab someone to plug a hole. Instead, they try to plug these urgent holes through free agent pickups or (hopefully) matured backups. Think again about those big holes the team needed to fill recently: replacing two great OTs, replacing a fantastic FS, replacing a pro bowl RCB. None of those were immediately attended to in the draft — the Eagles seemed more interested in throwing a bunch of lesser-regarded options at the problems in the hope that one might stick, at least for the short term. Perhaps this is an acknowledgement of the time it can take to teach up a player. Or it shows a general desire to build for the long run. And we can argue over the individual picks. But overall, despite any existing problems the team may exhibit, the Eagles pick players who they hope can have a big role a year or more away. When a player does contribute immediately, like Jackson or Maclin, that’s the exception and it’s often the result of injuries and luck. They were never expected to be counted on so early — something you can’t say about a lot of top rookies drafted by other teams. Admittedly, it’s tough to count on rookies, but position battles like FS in 2009 aren’t pretty either. So I’m not necessarily saying this is a good or bad strategy. However, it does seem to be a strategy, and to me, that’s enough to establish the DIN Theory. 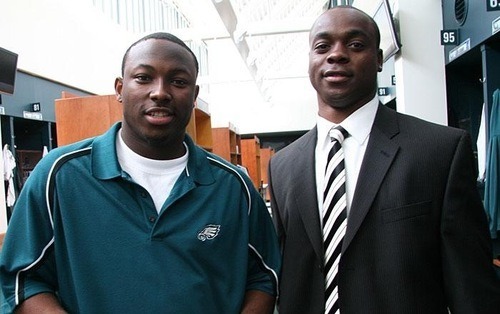 Tagged with Back-Up, Cornerback, DIN Theory, Depth, Draft History, Draft Pick, First Round, Free Agent, Long-Term, NFL Draft, Need, Philadelphia Eagles, Problem, Replace, Rookie, Second Round, Trade, Jeremy Maclin, LeSean McCoy, Kevin Kolb, Trevor Laws, DeSean Jackson, Brandon Graham, Nate Allen. June 21, 2010 by Brian Solomon.